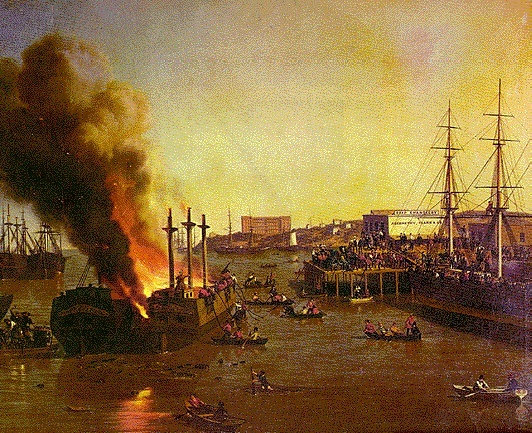 Fire hits abandoned vessels in Yerba Buena Cove, July 24, 1853... early firefighters row out to fight the fire. San Francisco's urban history is short but fiery. Before urbanization, fire played a more natural role in the local ecology. But with the rise of the city, fire reshaped the city's physical appearance, as well as making winners and losers of those destroyed or spared by the flames' havoc. There were half a dozen major fires before the enormous conflagration following the 1906 earthquake. The city was tiny -- only about 2000 inhabitants -- before the Gold Rush of 1849, but within a few months the population exploded to more that 25,000, four-fifths of them men. Most of the structures were flimsy -- canvas and scraps of wood, and there was not enough water to readily quench the flames. It was on December 24th, 1849, that a fire broke out early in the morning at Dennison's Exchange on the east side of the main plaza, which was bounded by Clay, Washington, Montgomery and Kearney streets. The fire, which burned until Christmas Day, established several precedents: most of the business section burned (more than $1,000,000 of damage), gunpowder was used to create fire breaks to stop its spread, and rebuilding began immediately (in this case, the 26th of December). On May 4, 1850 sometime after midnight a fire broke out at the US Exchange. Heavy winds drove the flames, and soon not just the four blocks around the Plaza, but also newer buildings between Kearney and Dupont (now Grant). In all 8 blocks were destroyed. Again, dynamite was used -- all the buildings on the west side of Dupont were blown. Although hundreds joined in fighting the fire, hundreds of others refused unless they were paid; there followed riots and looting. In all more than $4,000,000 of property was burned. The city was rebuilt -- even more flimsily than before -- within a month. On June 14th another fire started, this one in a bakeshop chimney during breakfast. It soon spread, and became the biggest fire of the three, destroying many provisions shipped around the Cape as well as many structures. On September 17th at 4:00 am the alarms were sounded again, as a fire at the Washington Market (a butcher on the north side of Jackson Street) broke out. This fire destroyed everything from Pacific Street to Washington Street, and from Dupont (Grant) to the bay (a lesser distance then than it is now, natch). 1851 map showing area burned. 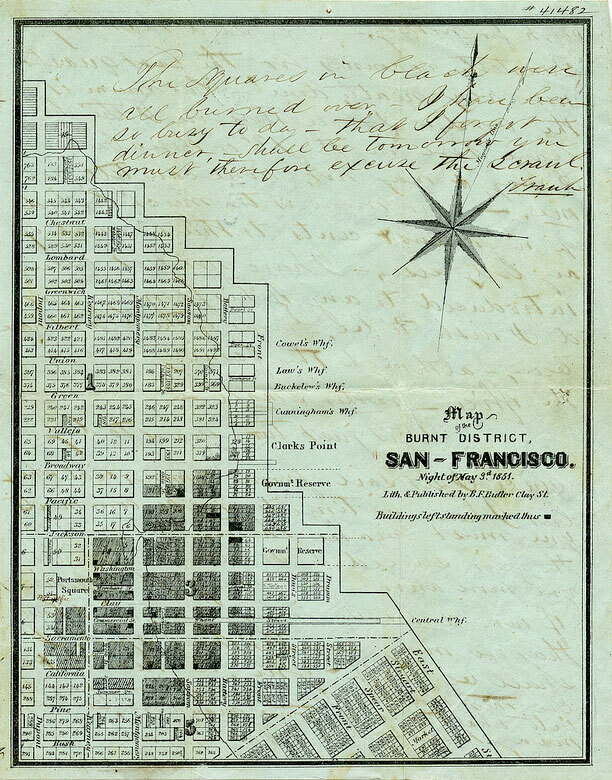 Then, on June 22 1851 conflagration again struck the city, burning residences from Powell to Sansome, and from Clay to Broadway -- about 16 square blocks, including many of the old landmarks of Yerba Buena. Hence, the 1906 fire was handled much the same way -- dynamite and rapid rebuilding.